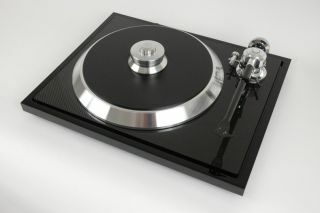 CES 2015: C-Sharp turntable unveiled by European Audio Team | What Hi-Fi? CES 2015 has provided a stage for European Audio Team to demonstrate its brand-new C-Sharp turntable, which becomes latest addition to the company's record player line-up. Carbon fibre and thermoplastic elastomers (TPE) are among the materials to have featured in the construction of the C-Sharp, with the base chassis built from high-density MDF. The base is the location for the "ultra low noise" motor and 10 damping feet, the cone shape of the TPE-constructed columns designed to absorb the motor's "unwanted energy". Other features of the C-Sharp include a belt made from anti-static rubber, with the design of the tonearm said to combine the benefits of a unipivot arm and the cardan bearing design. This bearing design aims to provide stability and ease of use, while the tonearm is also said to feature silicon-based grease designed to reduce tonearm/cartridge resonances by half. The tube is made from carbon, while the headshell has been constructed from light, rigid aluminium. EAT says this allows a "tighter mounting of high-end cartridges". It'll be available through Absolute Sounds for £2498, including its specially-designed C-Note tonearm.